I have fallen off the healthy breakfast eating band wagon the last month or so. Normally I am great about eating breakfast, but due to a variety of reasons the last couple of months I have grabbed for sweets more often than not first thing in the morning. It has finally started to catch up with me and I have been feeling not so fabulous the last couple of weeks. Therefore I woke up this morning and started my day the right way food wise. I have felt much better the rest of the day and am going to continue the healthy eating especially in the morning. One breakfast food that my family loves is bacon. The males in my family could eat bacon three times a day and be incredibly happy. This weekend I tried a new recipe for Roast Bacon Wrapped Pork from Food and Wine magazine. This recipe has 7 ingredients. It takes 1 hour and 30 minutes of total time, 20 minutes of which is active. I used pancetta instead of bacon since it goes great with pork roast. 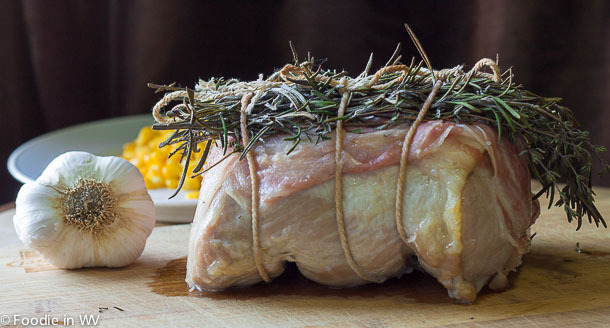 Make sure to tie off the roast or the meat will dry out during cooking. The resting time is also essential. It helps to keep all the moisture in the roast and is vital to any pork recipe. The flavor from the fresh herbs was great. I really love using fresh herbs since they create a lot of flavor with little effort. Plus they are very easy to grow in your garden. The roast that I bought wasn't the best. I would suggest using a high quality roast, the better quality really does make for a better tasting slice of meat. Overall, the flavor on this roast was delicious and the same herbs would work well with a tenderloin. For the recipe go to Roast Bacon Wrapped Pork. It's good to know the quality of the roast really does make a difference. I've heard it said that it doesn't matter so long as you cook it long enough to be tender, but I've always found that hard to believe. This is a recipe our family would enjoy. It definitely does make a difference. If you use a crockpot or pressure cooker you can use a lower quality cut of meat. But bacon wrapped pork has me totally excited! Yum! Yes, I could eat it 3X a day too! I tried this a year ago and it didn't come out to hot. I was following one of the food channel chefs and it still didn't come out. Thanks :) Going over to check out your site now! Thanks :) My family really enjoyed this!